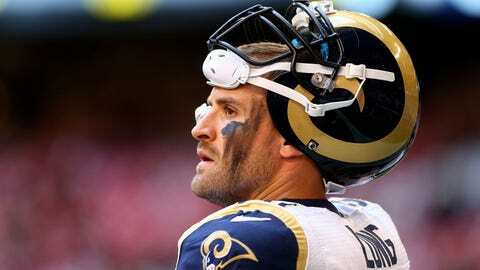 Chris Long has been part of a lot of bad Rams football but says a strong finish could help launch a turnaround 2014 season in St. Louis. ST. LOUIS — Don’t tell Chris Long that the St. Louis Rams have nothing to play for the final two weeks of the regular season. The Rams won’t make the playoffs this season, but the veteran defensive end — who in his sixth season is the longest-tenured Rams player — has a big goal for these next two games. "We have an opportunity to be .500 this year, which I’ve never been," Long says. "So I’m playing for that. That means a lot, even though it might not put us in the playoffs. At this point we know what’s possible and what’s possible is to finish two games really strong and kind of springboard us into next year. Next year we’re not a young team anymore. There are no more excuses and we need to win." Things haven’t gone as planned since the Rams selected Long with the No. 2 overall pick in the 2008 NFL Draft. Frankly, things just haven’t gone well in St. Louis since then. The Rams went 2-14 in Long’s rookie season in 2008, which saw the Scott Linehan era come to an end in favor of interim coach Jim Haslett. Then in 2009, the beginning of the Steve Spagnuolo era, the Rams were even worse at 1-15. St. Louis, which hosts Tampa Bay on Sunday, is just 25-68 since Long was drafted. The best season during that span? 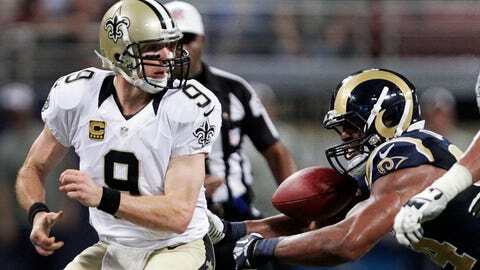 Either the 7-9 campaign in Sam Bradford’s rookie year in 2009 or the 7-8-1 debut of coach Jeff Fisher in 2012. Unless the Rams (6-8) can get to 8-8 this year, which would require wins over the Bucs and then at Seattle in the final week of the regular season. But the Seahawks, at 12-2, have the best record in the NFL after 14 games. "It’s been tough," Long says of his six seasons in St. Louis. "It’s been tough, but at least now we have reason for hope, reason to look forward to the future. There have been times before where it’s not like you don’t buy in, but sometimes in the distant past you weren’t sure how we were going to get better right away. Now we’ve got some evidence of how we can get better. We just need to be more consistent and the young guys have to keep getting experience and it will come together for us. I believe that. If we can just play like that every Sunday, we’d be pretty tough to deal with." Long, 28, hasn’t missed a game in his six seasons. His 48.5 career sacks — which included recording 13 in 2011 and 11.5 in 2012 — are tied for 15th in the NFL over that span. Long has 6.5 sacks this season along with 32 quarterback pressures, 19 quarterback hits, two forced fumbles and two fumble recoveries. He also provided one of the defensive highlights of the season when he returned a fumble against Indianapolis for his first career touchdown. Taking a break from serving as fellow defensive end Robert Quinn’s unofficial publicist and PR director, Long was asked how he evaluates his own 2013 season. "Pretty good," he says. "I’m playing better than I did last year. The numbers aren’t there but I don’t really measure myself by numbers. I like to have them. As long as our D-line is playing well and I’m doing my job, I’m happy with that. I’m not content. I’m never content with how I play. I’ve just improved at each area of my game." Long’s consistent approach to the game and working to get better has been beneficial to the development of his younger teammates. They know what he’s been through since he arrived in St. Louis and they see a guy who doesn’t appear to be slowing down anytime soon. "He just comes to work and consistently brings the same effort no matter what the situation, no matter what the record," says middle linebacker James Laurinaitis. "He doesn’t change when we’re winning. He doesn’t change when we’re losing. He’s the same guy. I think it’s that consistency that the young guys in that room and the other guys can look up to and know no matter what the situation, Chris is going to show up and give everything he has. He’s a warrior, man. There’s a lot of times — I know he hasn’t missed a game in his career — there’s a lot of times he’s played through a lot of stuff and played well. It’s always good to have guys like that where you know when I go to bed I’m not worried if 91 is going to show up. He is." Rams defensive end William Hayes rates Quinn and Long among the top five defensive ends in the NFL right now. "When you think of the St. Louis Rams now, you think of Chris Long," Hayes says. "He’s a guy who you know is going to come to work every single day and you can look at and get energy from. You don’t really see him take plays off. And that’s even at (practice) too. He carries over what he does at practice to the game. He’s a great player." Long still has plenty to play for and plenty left to prove. He is one of the foundation pieces of this franchise and he knows that there are no more excuses going forward. The Rams need to win — and so does Long.